VMware Labs just released a really cool new Fling called VIB Author which is a tool that allows you to easily create custom VIBs for your ESXi 5.x hosts. If you have tried to create custom ESXi firewall rules or add custom scripts to your ESXi host, you may have noticed they are not persisted after a system reboot and you had to play all sorts of games to get the files to persist. The VIB Author tool now solves that problem and you can even take your custom VIB and integrate them into an Auto Deploy Image Profile using Image Builder. Before you jump right in, be sure to read over the important note in the documentation before getting started. 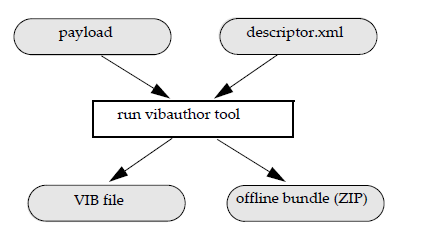 So how does the VIB Author tool work? You will need to provide two pieces of input: payload which is set of files you wish to include in your VIB and the descriptor.xml which contains the metadata for your files. From that, VIB Author can produce either a VIB and/or an offline bundle (can be used with Image Builder). VIB Author is distributed only as an RPM and you will need to install the VIB Author tool on a 32-bit Linux system (sorry, no 64-bit support). In my home setup, I went with CentOS 6.2 i386 as it was free to download & easy to setup or you may choose go with SUSE Linux Enterprise 11 SP2 which is the recommended platform per the documentation. Disclaimer: The example below is not officially supported by VMware, please thoroughly test this in a development environment before using in production. Step 1 - Create your stage directory structure which we will then populate with your payload files as well as the descriptor.xml file. 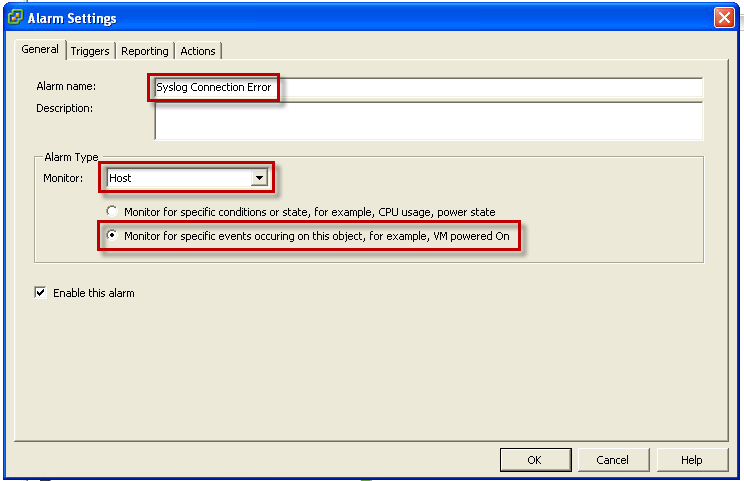 Step 2 - Create your descriptor.xml file which should be placed in the stage directory. For more details on the parameters within the descriptor.xml, please take a look at the documentation. This one should be pretty straight forward, we are just creating a custom ESXi firewall rule and you will need to place your configuration file under /etc/vmware/firewall, please take a look at this article for more details on creating your own firewall rules. 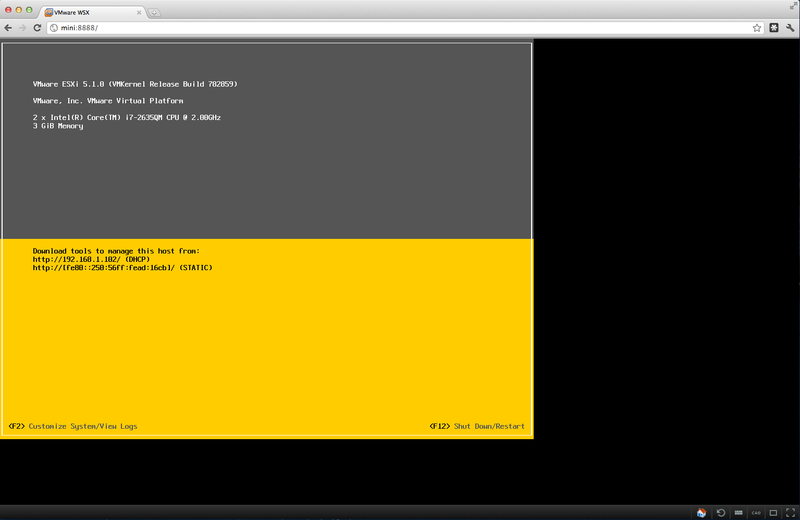 This is a custom shell script that adds a static route to an ESXi host upon bootup under /etc/rc.local.d. 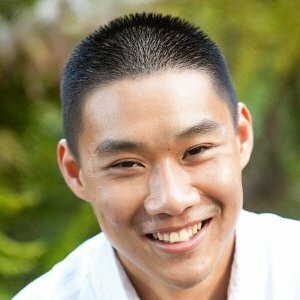 There maybe other startup scripts that could be executed and you do not want to conflict with any system defaults. I recommend you label yours with a high number such as 999 to ensure it is one of the last scripts to execute. 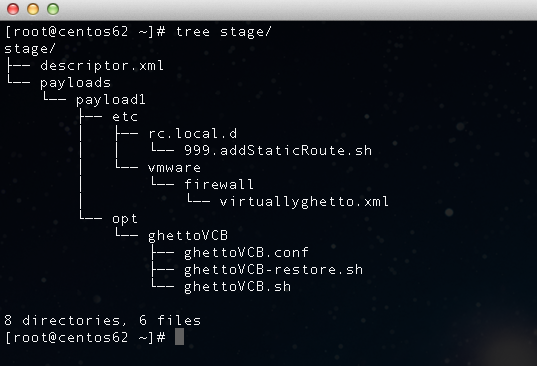 This is a custom set of files that I would like to store in ESXi under /opt directory and the files are my free ghettoVCB backup script. Here is a copy of my directory structure (stage.zip) which can be used as a reference. Note: Since we added some files outside of the default supported paths, we also need to specify the -f flag to force the creation. Finally, we are now ready to copy the VIB over to our ESXi host and install our custom VIB. So there you have it, in just a few steps, you can create your own custom VIBs! I was just cleaning up one of my development labs and found that one of my VCSA (vCenter Server Appliance) which I had configured with vSphere Syslog Collector was no longer capturing logs for several of my ESXi hosts. After looking at some of the ESXi logs, I realized that I had rebooted the VCSA at one point and that caused an interruption in syslog forwarding and then knew immediately that I just needed to reload the syslog configuration via ESXCLI as noted in this VMware KB to restore log forwarding. After restoring my syslog configurations, I had remembered a neat little trick I learned from one of the VMware TAMs about creating a vCenter Alarm to alert you when an ESXi host is no longer able to reach a remote syslog server. I thought this might be very handy alarm to have in your vCenter Server in case you hit a similar issue or having some connectivity issues with your syslog servers. By default, there is not an event on syslog connectivity but you can create a vCenter Alarm based on an eventId which shows up as "esx.problem.vmsyslogd.remote.failure" in both /var/log/hostd.log as well as /var/log/vobd.log. Now that we know the eventId, we just need to create a vCenter Alarm which will notify us when it has a connectivity issue with it's configured syslog server. 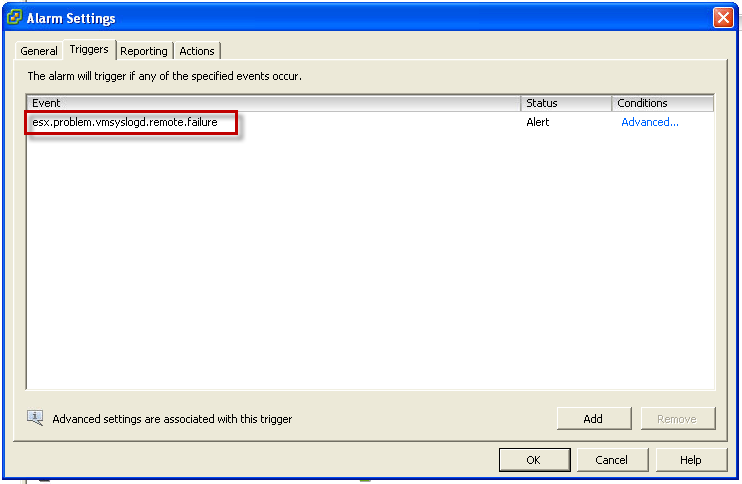 Step 1 - Create a new alarm, in this example I am calling it "Syslog Connection Error" and you will need to specify the Alarm Type as "Host" and monitor for a specific event. Step 2 - Next, click on Triggers and we will go ahead and paste in our eventId which is "esx.problem.vmsyslogd.remote.failure"
Step 3 - Lastly, you can configure an Action, if you wish to send an SNMP trap, run a command or send an email notification. In this example, we are just going to generate a regular vCenter Alarm event, so go ahead and just click OK to save the alarm. To test the alarm, I just disabled the syslog-collector on the VCSA using "service syslog-collector stop" and you should see an alarm generate for any ESXi hosts forwarding it's logs to that particular syslog server. So now when your ESXi hosts can not reach it's syslog server, you will automatically be notified and can look into the problem immediately. Now having an alarm is great ... but you might be wondering what about the need to reload the syslog configuration on all your ESXi hosts to restore syslog forwarding? This can definitely be a challenge/annoying, especially if the syslog server's connectivity is returned after some amount of time and you have hundreds of hosts. Well luckily, you no longer have to worry about this, with the latest ESXi 5.0 patch03 that was just released, this problem has been addressed and ESXi syslog daemon will automatically start forwarding logs once connectivity has been restored to the syslog server. It is still definitely recommended that you have more than one syslog server in your environment and that they are properly being monitored. Also, do not forget with ESXi 5.0 you can now configure more than one remote syslog server, for more details take a look at this article here. Note: After applying the patch, you will no longer be able to generate an alarm based on the eventId for syslog when using UDP. You will see something like "Hostd [290D5B90 verbose 'SoapAdapter'] Responded to service state request" in the hostd.log. The alarm will only be valid if you're using TCP or SSL protocol for syslog which have not been patched with latest p03. There were some discussions earlier this week about copying Virtual Machines from one ESXi host to another ESXi host that reminded me of a very cool feature in the ovftool that could help with this task(which I thought I had written about already). As you probably have guessed by now, I am a big fan of the ovftool and have written several articles here, here and here. It still surprises me with the amount of features this little utility contains and this particular one is definitely a cool one! If you have ever needed to copy a Virtual Machine from one host to another, it can be a challenge sometimes, especially if you do not have shared storage. You can of course leverage tools like VMware Converter or exporting the VM to a "middle man" system and then re-importing that VM into the destination host but it could take awhile or you have to run a Windows system. Well, if you are looking for a quick and easy way to copy a VM from one host to another, try using the ovftool. 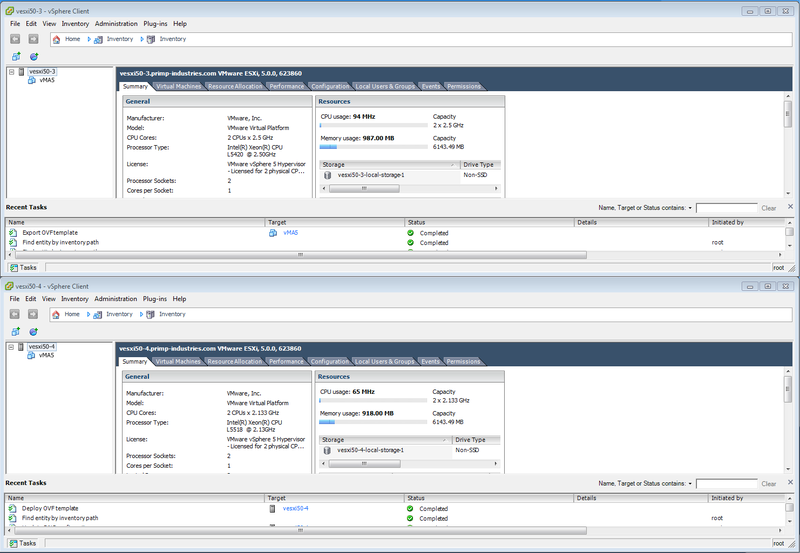 In this example, I have two ESXi hosts called vESXi-03 and vESXi-04 and they both contain a single local datastore (no shared storage). I have a VM called vMA5 that is located on vESXi-03 and I would like to copy that directly to vESXi-04 without needing any additional storage. 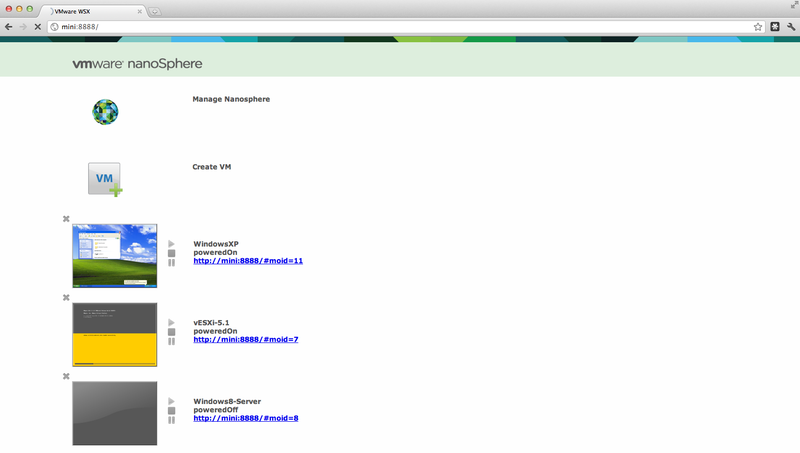 Note: A VM must be powered off for ovftool to transfered or exported. There are also other options that you can specify such as the network configuration and power options, please refer to the ovftool documentation for more details. If anyone is interested in how this works, the system that is running ovftool acts as a proxy between your source and destination. The system running ovftool IS in the data path during the transfer but its only for the data to stream from source->client->destination. Nothing is stored on the client system and you do not need to have the storage capacity of what you are transferring. This is very nifty little feature that many people are not aware of with ovftool.